Polly photographed with Guru’s Venison Sausages at Hartshill Hayes Country Park. We met the lovely people at Guru Pet Food and learnt all about their brand and how brilliant their dog food is. 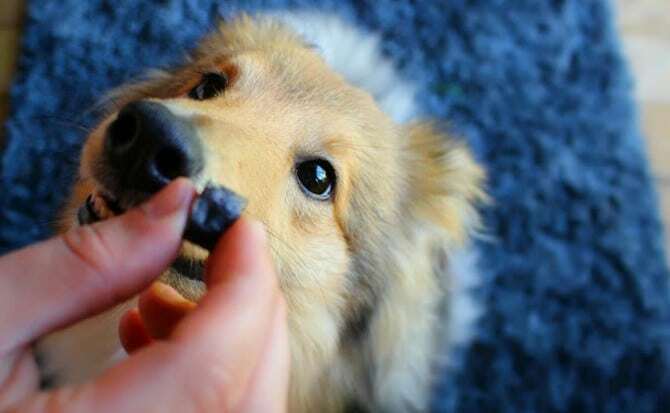 Without over complicating things, cold pressed dog food is a process which simply retains as much of the nutrients as possible. 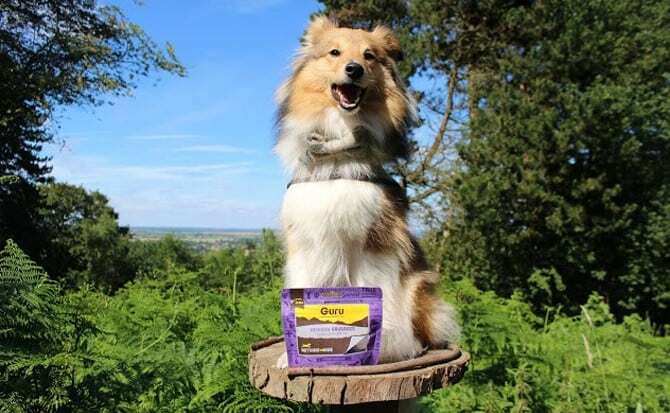 If you don’t like the hassle of a 100% raw diet, Guru’s dog food is as close to a dogs natural diet you can get. Now your probably thinking that this food must be do expensive to feed your dog, however I am delighted to confirm that you use up to a third less per portion compared to most extruded kibble, so your bag lasts much longer. We were shocked to discover how, after one hour the cold pressed food starts to break down whilst during the same time dry foods start to expand and float. After 3 hours, the cold pressed food has completely broken down optimising the nutrients within the food, whilst the dried biscuits have only expanded. When you look at the glasses pictured below it is of course not an attractive sight, but it is such an important and interesting visual. The glass on the right is cold pressed Guru food, as you can see the food is completely broken down which allows your dog to absorb as many nutrients as possible. 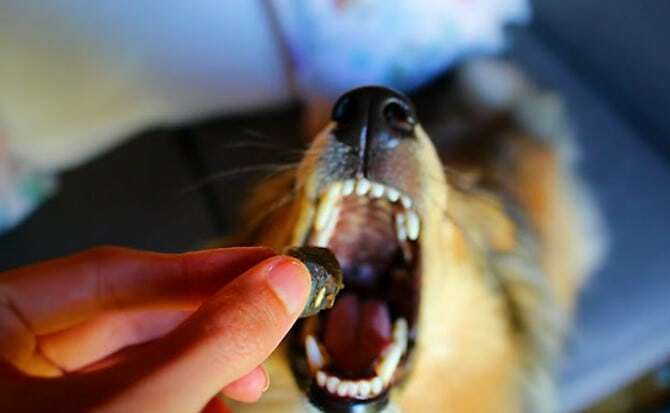 In comparison, the dried biscuits on the left have expanded, making your dog feel full, however the nutrients are all hidden inside the biscuit and are inaccessible to your pooch. 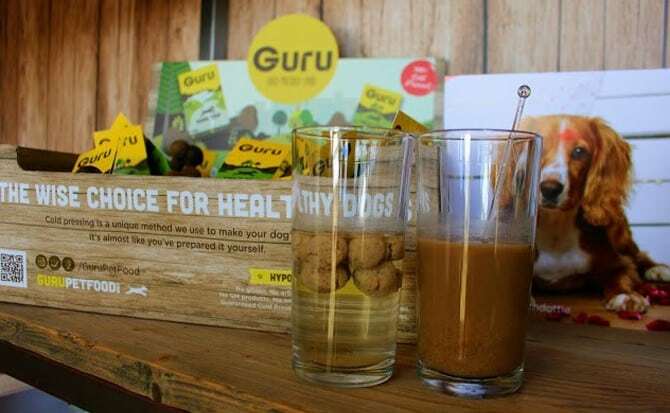 So Guru is more than likely cheaper AND most importantly, better for your pup. When looking into your dogs food it’s vital that you look at the ingredients, a lot of well known branded dog foods on the market are full of additives and artificial colours.We were very lucky indeed to take a variety of Guru’s products away with us to try and well it’s fair to say Polly LOVES them! It’s peace of mind knowing that everything we are feeding her from Guru can help improve her skin and coat, strengthen her immune system and even help freshen her breath! Feeding Guru really is giving your dog the best! They are so tasty, Polly will do anything you ask of her, we can’t leave the package in sight as she will challenge herself until she’s too pooped to get it! They come ready sliced which not only saves time but are also easily breakable for some delicious training treats or for a special reward! They are naturally air-dried which maintains the flavour and nutrients of the sustainably sourced British venison meat, Guru pride themselves on having NOTHING TO HIDE. Check this out! We did say Polly LOVED them! I have never seen anything like this before, it’s so unique and utterly brilliant! 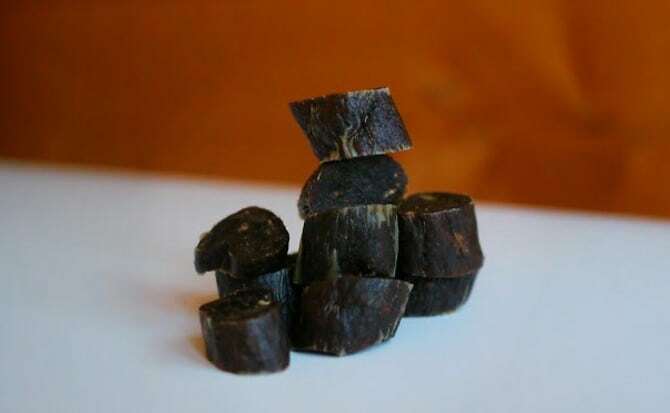 Guru’s trip bones are a cold pressed dog treat that you can take anywhere with ease. It’s perfect if your out and about a lot, as you can just pop it into your bag, so that your dog can be fed it’s normal high quality food in a fun and mentally stimulating way. When we pop over to Jack’s parents house, our visit is usually only a few hours due to Polly needing to be fed at home. 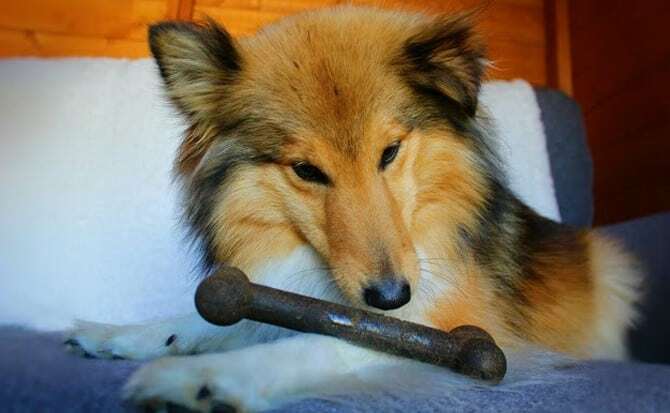 However, with a trip bone she can be fed her normal high quality food which is within the bone that consists of 28% Dried Ground Chicken and Brown Rice. Oh yeah, your drooling right? We often have long days when we are doing bits and pieces for our blog or Instagram. But now with a trip bone in our bags we don’t have the hassle of bagging up Polly’s food and most of all risking it bursting into our bags leaving a beautiful fish aroma for all to smell! Oh no, after the first few licks I just can’t stop! I would 100% recommend the trip bones they are absolutely wonderful!